Welcome to the Marine Historical Society of Detroit! The Marine Historical Society of Detroit, a non-profit organization founded in 1944, provides a focal point for individuals and organizations interested in and concerned with the history of the Great Lakes and its maritime heritage. Membership includes the Society's monthly publication The Detroit Marine Historian, which offers a variety of articles exploring aspects of Great Lakes shipping past and present. Features include Great Lakes Ships to be Remembered, a look at Marine News from 100 Years Ago, and The Log, a digest of current news concerning Great Lakes shipping. Membership also includes an annual, full-color calendar featuring superb photographs of Great Lakes ships of the past. In keeping with the Society's objective to further interest and preservation of Great Lakes history, we have published several quality books, including three volumes of Great Lakes Ships We Remember, two volumes of Ahoy & Farewell and GLEW, an illustrated history of the Great Lakes Engineering Works shipyard. Many of the photographs used in these publications are rare and are not available elsewhere. In keeping with the Society's objective to further interest and preservation of Great Lakes history, we have also provided financial support to worthy projects around the Great Lakes, among them the Lightship Huron Museum, the Col. James M. Schoonmaker and the William G. Mather museum ships, the Great Lakes Maritime Institute's William Clay Ford pilothouse and Edmund Fitzgerald anchor raising projects. The society has also given scholarship support to The Great Lakes Maritime Academy at Traverse City. Our archival collection has been donated to The Historical Collections of the Great Lakes at Bowling Green, Ohio, where it is available to researchers and historians. The Society annually names an Historian of the Year. The award honors those who have contributed significantly to the research, presentation or publication of Great Lakes ships and the shipping history. All those honored are listed on the Historian of the Year page. 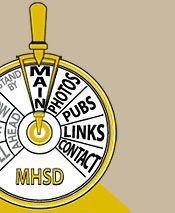 MHSD has members in the United States, Canada and around the world. We would be pleased to have you join us. Once again, it's time to renew your membership for another year. As a non-profit 501 (c) (3) and a fully volunteer organization, The Marine Historical Society of Detroit counts on members like you to help support its endeavors in the preservation of Great Lakes maritime history. As we all know, many fine chapters of history have drawn to a close as the size of the Great Lakes fleet continues to dwindle. With your help we will continue fulfilling our mission, which is to remember the ships and sailors that have plied the Great Lakes and their contributions to our history. Renewal notices were sent to all members in July. We appreciate your past support of the Society, its programs and publications. We certainly hope that you will continue to be a part of our future and we look forward to providing you the many benefits of membership, including our annual calendar and the monthly Detroit Marine Historian, that you have enjoyed in the past. We ask that you return your renewal notice with your $40 payment (U.S. and Canada; $50 international) in U.S. funds, to James R. Hoffman, 4635 Mallory Court, Toledo, OH 43623-2000.Your promptness in renewing your membership is appreciated. If you do not receive your form in the mail and prefer to renew by mail, you can use our online mail form. Paul C. LaMarre III has been named the 2018 Marine Historical Society of Detroit Historian of the Year.